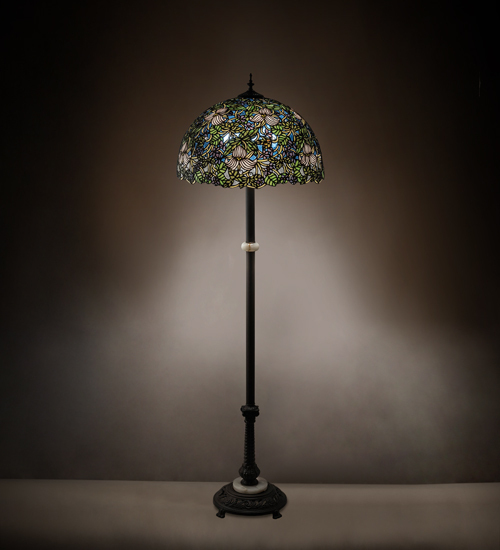 Description: Nature abounds in this Meyda Tiffany designer stained glass shade. Glistening ruby red berries, Ivory trilliums and clusters of Purple violets with Woodland Green leaves make a lacework of wildflowers against a Cobalt Blue forest sky. Each piece of glass in the shade is hand cut and wrapped in copper foil. The floor lamp base is hand finished in Mahogany Bronze and accented with real marble pieces.